love your fun vinyl set - such great colors and interesting fonts. that imaginary world is a great site too! hope you guys are feeling better! thanks for the great links as always ward! Your posts are always such fun. Retro kid is carrying on in that tradition. Great, great stuff! thanks for all the credit, love. I get really excited when I find something that I think you'll dig... nothing makes me happier than to bring home the goodies to you. Very cool stuff - the sun face on the cover of the Riddle Me This record looks like the sun from the Our Mr. Sun film from the Bell Science series, which is a good thing. I also really like the great use of limited color palate on the New York brochure. Proves the point that sometimes working with limitations encourages great invention. Hope everyone in the house gets well soon. Hello, Ward. This is your friend from the corridors of academia. 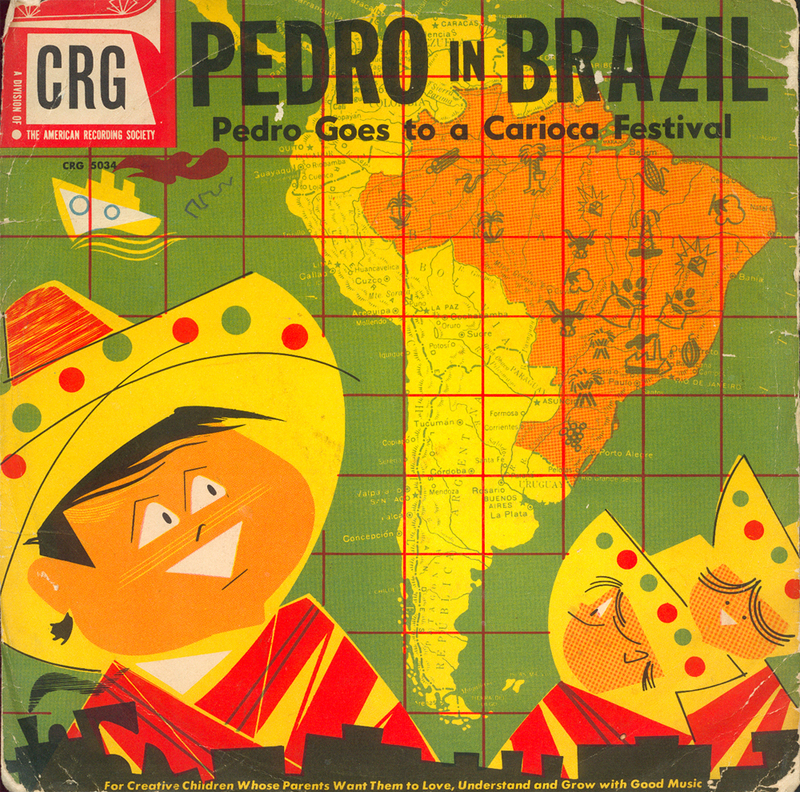 I was interested in the record cover since I just went to Brazil. It's got that Mary Blair abstraction to it - though would Blair use those colors? "Carioca" I'm pretty sure is the name for Rio De Janeiro locals. phillip's comment in '06 is very accurate. Update for phillip or anyone else interested in Rudi Bass, is that Rudi is back in the states after living and working in Paris for several years, and at age 94 is still a very active artist and creator. Just finished illustrating a children's book that will be published this year. Thanks for the feedback, doc! I'm very curious to see what she's up to. Please feel free to email me (see my profile page) to stay in touch. Or, just post another comment here on this post. Thanks to both you and Philipp! Thanks for your interest, and as time permits, will keep you updated on Rudi Bass's latest. Btw, "she's" very much a "he," born in Vienna, Austria as Rudolf Bass, where Rudolf, shortened, becomes, "Rudi." Really glad I stumbled onto your blogspot! Doc, I'm very thankful for you finding my blog and for updating us on who Rudi Bass is and what he's doing. And I'm so sorry about the gender mix-up! I guess I assumed with the 'i' at the end of a particular name that Rudi would be female. Thanks for clearing that up for me! Definitely keep me posted and I'll do a new post about Rudi in the near future. My grandparents were good friends with Rudi Bass. They must have lost touch because I didn't know he was still alive. They told me that he designed the current CBS logo. Verification? Any feedback as to his relation to Saul? Alyce's comment appeared in my email account, and I replied. For anyone else interested, Rudi Bass (no relation to Saul), while Art Director at CBS News achieved international fame when he created an entirely new videofont greatly improving how we see and read print on the screen. He, himself, having been schooled in art in 1930's Vienna still does his own lettering in addition to the drawings when the creation is completely his, as in "How to Talk to a French Crocodile," an intro to French in a fun and funny book. As in all his prolific drawings and writings, they're full of his Viennese whimsy and humor.